Helser Bros. Transfer Company was founded about 1902 by John Charles and Henry Helser who specialized in the transfer, express and drayage business. John Charles and Heinrich were the sons of Heinrich and Christina Hölzer who were early settlers in Portland. Heinrich Helzer founded the First United Mennonite Baptist Church. The 1912 Portland City Directory shows the Helser Bros. company located at 212 Couch (in northwest Portland) with a barn located at 350 Stanton (on the east side of Portland). At that time, the Helser brother lived on the east side near the barn. John C. resided at 411 Stanton and Henry H. at 350 Stanton. Helser Bros. Transfer Company. Courtesy of Marna L. Hing. My grandfather started and owned Helser Bros. Transfer Co. in Portland. His name was John Charles Helser and I believe he started the business either with his father or a brother. My father, Marnell Raymond Helser, owned the business after John Charles Helser died. My father died in 1948 and my mother Lucy Lee Thomas Helser ran the business until she sold it to Green Transfer in about 1950 or 1951. Helser Bros. remains in business today (2016) at 7025 N. Leadbetter Road in Portland. My family came to the United States in 1876. My grandfather, John Charles Helser, was born September 12, 1881 in Hastings, Nebraska. One of my grandfathers brothers was born September 16, 1876 in Russia and another brother was born January 1, 1880 in Hastings, Nebraska. They moved to Portland when my grandfather was 11 years old in late 1891. My Helser family was among the first Volga German families to come to America. In going back through my notes, Helser Bros. 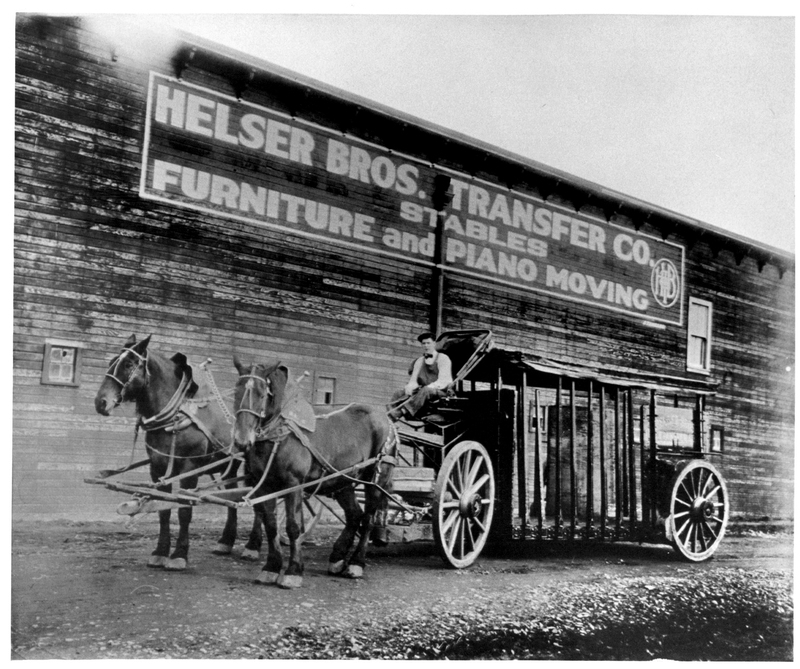 Transfer Co. was founded about 1902 by my grandfather John C. and Heinrich (Henry) Helzer. At this point I'm not sure which Henry Helzer it was, but I believe it was grandfathers' brother Henry who was born Sept. 27, 1868 in Norka. When my dad owned Helser Bros. Transfer it was located in northwest Portland down by the waterfront. A family of gypsies lived next door to the company. I was about 5 years old. My dad died in 1948 at the age of 42. The picture of the house was probably taken in NE Portland, I think that is where the Helser family lived. I have in my notes that the family attended the Second German Baptist Church on the corner of Morris and Rodney. I also have in my notes that Katherine Helzer has a brother Adam Helzer and a sister Mrs. John Rattey. I was looking at my notes that I took about 10 years ago and find that Jim and Teri Helser now own Helser Bros. I believe Jim is one of Morrie Helsers' son's. Morrie was my dad, Marnell Raymond Helser's cousin. Morrie's father was Henry H. born Sept. 27, 1868. The Helser's came from Norka, Russia. The surname in Russia was spelled Hölzer, it was changed to Helzer after they came to the United States. My grandfather changed our name to Helser sometime in the early 1900's because the other Helzer's in Portland were garbage men. That is what I was told by my Aunt Thema Helser. My grandfather, John C. Helser died in 1929, twelve years before I was born. Story courtesy of by Marna L. Hing (née Helser).